There are three sets of stairs in this area, one between the two circular areas, one at the top of the larger circle and one just beyond on the opposite side of the small roofed structure. I think the lavender flower blossom is a position indicator for which stair we must have at our back as we face the water. 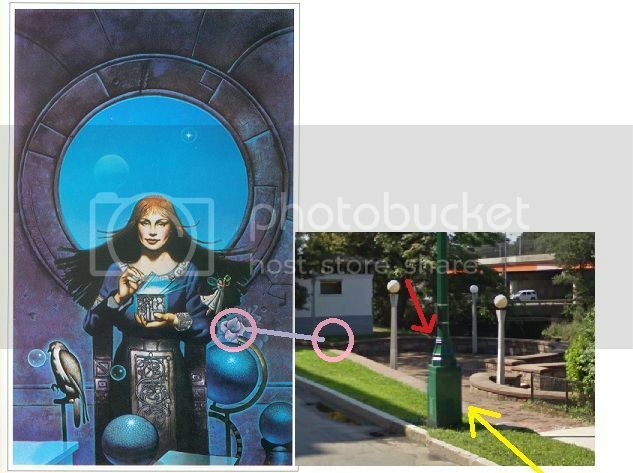 I think the green lamp post is centered in the perspective when standing on the back to stairs facing water spot, balanced on a virtual circle made by the larger ring and most importantly, in line with the Leif Erickson statue (yellow arrow and white diamond shape) which faces west (In his direction). Eric, I have been there, among other places in Boston, prepared to dig. I just dont think it possible that the casque is in this location. Many reason but common sense -once there- was my most compelling. Nothing from pic or verse of where one would exactly put shovel to ground to even begin. Domino, thanks for the first hand intel/insight. I'm surprised you don't think the site fits in a common sense way. 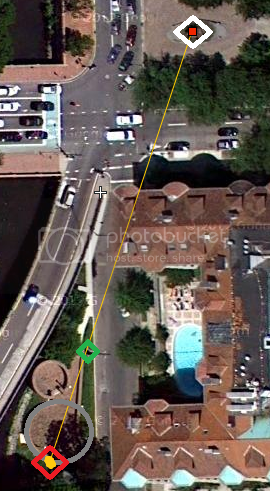 I think several factors, which can't be ignored, are immediately linked to this location. I think the Longfellow poem and the Sommerset connection are huge supporting clues. I'll try to rebuild a more complete walkthrough of my theory soon. weird, all 3 posts made in last 2 days, but a member since 2012? I'm going to advance the theory that the final lines used to direct you to a spot, and there was a sign that referenced Paul Revere's ride under the lamplight that is no longer there. In the thirty years since the book was published, a sign was moved. I've been working on the Fandango puzzle, and I use google maps, of course. I was in Bar Harbor researching it and I took a picture of an 'object of historical note' sign, this was four years ago. I go look on google maps today, that sign is gone. I finally found it. They modified the street and the sign was moved twenty feet away. If it wasn't for Google maps or my picture, nobody would know it was ever there originally. I think there was a sign referencing Paul Revere's ride, under the lamplight, face the water, back to the stairs, and that's where you dig, in front of the sign. Time has erased all the monuments that were there. The Chicago casque was only found when Preiss sent them pictures. Thirty years later, it's all gone. You have the basic area. Where exactly is long gone. bnut, great thoughts. I like the way you use the poem to derive what we should expect to find, that being a sign or marker to do with Revere no longer present, but I dont think thats the case here. There is evidence that the green street light tower is a replacement from the old one that stood just a few feet away in the middle of the brick pave. I believe its a critical part of the puzzle, fortunately we have the old 2009 Google street view to prove that displacement. I have a dramatically improved theory on Boston since 2012. The last line "in truth, be free" is subtle as heck. It is telling us to look for a very specific "T" (T for truth) and find the backwards S symbol on the Somerset building's iron gate where the vertical green light tower intersects it like a dollar sign "$". The idea is that a reverse $ means "free". Someone needs to dig in that spot between two globe light posts on the inside of the low fence line. Its just five steps in from the small fence gate that faces the water. "fortunately we have the old 2009 Google street view to prove that displacement" Unfortunately, we have nothing for the 27 years prior to that. Sorry, but I don't really buy the incredibly subtle clues. "The idea is that a reverse $ means "free"." I have no idea whatsoever what that means. How does a reverse dollar sign mean 'free'?? You mean like a reverse dollar sign means the opposite of money, so free? I would politely call that a real stretch. You're going to hurt yourself stretching that much. From right to left", etc. The Boston one gives specifics, and then seems to trail off at the end, but I think what it referenced was probably obvious in 1982. See the Chicago puzzle for a comparison. Imagine if it hadn't been solved in 1983. The park has changed a lot, the fence with the distinctive post is gone, the Lincoln statue has been moved to a different park. The ten by thirteen trees had apparently been altered even by 1983, which made it difficult for the finders to track down the casque without the photos that Preiss sent them. The whole area has been planted over now. It would be absolutely unfindable today. And unfortunately, I think the same problem exists for the others. edit: We have nothing before Google maps started around 2005. "The table at lower left in the image is an interesting match for a utility box that once stood in the Charlesgate area beside the "two circles" structure. Note the white surface and the top that extends out over the sides. The box has been removed now, but it can still be seen in Google street views from earlier years." Do we know the box was there in 1982? If the box was there after 2005 and not there now, I mean, how do we think it was there in 1982? "One set is on the far side of the pumphouse, going up to the door. This spot is highly unlikely because of the risk of hitting underground cables or pipes." Do we know the pumphouse was there 30 years ago? Maybe the casque was buried there in 82, and covered over. There really aren't records of pumphouses and signs, and nobody really takes pictures of utility sites. Anybody have evidence the pumphouse was there in 1982? I feel what you're sayin, but I think the subtleties of the puzzles are not to be underestimated. The Chicago and Cleveland puzzles may be subject to oversimplification, yet I find significant elements that suggest a deeper intelligence at work. The harder questions aren't being asked, and their answers are even harder for lack of proof. Going about the puzzles as if they are dramatically affected by missing markers is more of a soft excuse. The suggestions posed by the wiki that there was a literal box marking the casque position isnt a bad idea but the discovery or expectedness doesnt fit my understanding of the puzzle from a well worked perspective. I dont want to sound overindulgent but it matters to understand why the verse begins with "if Thucydides..." and carries over to the Landlord's Tale so an exile may feel at home across the way from the "prison bar" of the Somerset in the luminescence of the full moon's light. You have to read to whole account of Paul Revere's evening as he slips past the Somerset while crossing the Charles. Eh, if you say so. I think they can easily be overestimated. One puzzle was solved by recognizing a building in the picture and then finding some simple markers in a park, the other was found by googling some text in the poem, and then seeing the actual structure in the picture. If you want to drag the full path of Paul Revere's ride, Greek history, whatever the Landlord's tale is, exiles from prison bars, and whatever else in, I wish you good luck. If key markers are no longer there, I don't think dragging in all the history and literature and theories is going to help you.